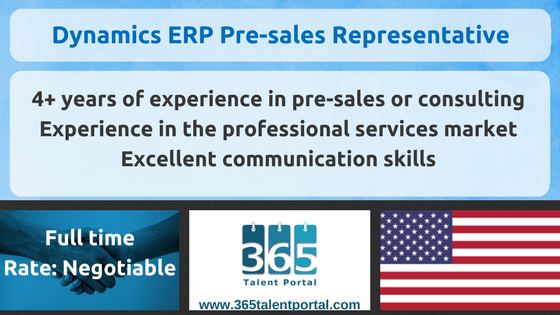 The Dynamics ERP Pre-sales Representative is responsible for building and presenting customized product demonstrations of our Microsoft Dynamics 365 and related ISV products, and explaining, based on a proven track record of implementing similar technologies, the capabilities and uniqueness of our solutions. ERP Pre-sales Representative will be a remote, full-time job and candidate will identify and define customer needs, objectives, business requirements, lead product demos, and create value by participating throughout the sales cycle. The role is characterized by his/her ability to build strong relationships. Lead the demo of Dynamics 365 (Finance and Operations, PSA, Sales, Marketing & Field Service) while also highlighting the benefits of the company offerings. In concert with Account Executives and/or Regional Managers, establish credibility and confidence with customers/prospects during sales campaigns. Help develop and maintain the company’s “trusted advisor” status with customers by company’s ability to meet customer needs. Must possess strong relationship-building expertise, creative thinking skills, and exemplary problem-solving abilities. Must be experienced in business application software sales, consulting or solution implementation, preferably in the Professional Services Market. Must have experience demoing ERP Systems in the Professional Service space. A Bachelor’s degree in Business Administration (Finance, Accounting, or Engineering) or degree in Computer Science is required; an MBA or Master’s degree in a related discipline is preferred. Experience in the Professional Services market is a must. Four to eight years of experience in pre-sales or consulting, and a desire to work in a sales environment.